The year is 1980 and the ailing Milwaukee Road has finished shedding thousands of miles of non-profitable secondary lines to evade falling into the history books forever. Unfortunately, that would come 5 years later. From the thousands of miles shed some would never see a train again. However, there were a few that had enough business to hold their own. One of those lines was the former Milwaukee Road's Northern Division in Wisconsin, which consisted of 147 miles of railroad stretching from North Milwaukee to Horicon. Also, lines branching west to Cambria and north to Oshkosh and the segment going west from Brandon to Markesan. This whole division was on a list for abandonment since 1977 and with help of the Southwest Wisconsin Rail Users and Development Association; a new railroad was born on April 29th, 1980. From rags to riches we bring you the Wisconsin & Southern! 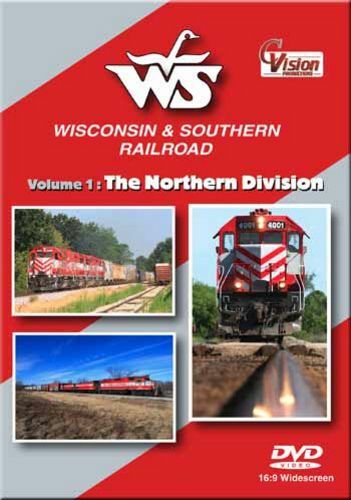 In this volume, we cover the WSOR's Northern Division. This portion of the Wisconsin and Southern includes the Milwaukee, Oshkosh, Mayville, Cambria, Markesan and Plymouth Subdivisions. Motive power includes many of the WSOR's MP-15's, GP-38's and SD 40-2's. Most of which are painted in their attractive red and silver paint scheme. Also included are recently acquired units from the BNSF and Nationals de Mexico. We even catch an inspection train with the WSOR's elite E-9's! From the rich, fertile farm fields to the bustling city of Milwaukee, you will enjoy watching this vibrant regional railroad working across America's Dairyland! train-nut (Manteca ca) on 2013-02-11 21:30:03. First off the Wisconsian and Southern always intrested me from the paint job on its locamotives to the fact the railroad operates former Milwaukee road trackage!! the railroad seems to be doing brisk buisness these days and haul everything from wind turbines to miltary vehicles and more!! This video is part one and very interesting in the locomotive lash ups to the countryside it travels thru!! i give this a excellent rating and i cant wait for more!! GOOD JOB C VISION !! !